Good one. Blogging is important for us. Journal of Empirical Legal Studies (JELS) fills a gap in the legal and social science literature that has often left scholars, lawyers, and policymakers without basic knowledge of legal systems. Always timely and provocative, studies published in JELS have been covered in leading news outlets. It would be interesting to see a comparison of author prestige multiple publications in law reviews and peer reviews. I suspect the "Sunstein effect" would make law reviews look like they have more author prestige effect, but after introducing a dummy variable for Cass, I'm not sure how much difference you would find. Dylan: A standard sort of approach to an observational study would be to examine whether (coded = 1) or not (coded = 0) a particular submission was accepted at a particular journal, and to model that as a function of variables describing the article itself (subject matter, length, etc.) as well as the author (affiliation, rank, etc.) and perhaps the journal as well. The statistical approach would be a regression-type model (like a logit or probit). Of course, one would have to know which manuscripts were submitted to which journals, and ideally have some idea of how the expedite process played out in each case. But, there again, even an imperfect study along such lines could tell us a lot about the factors which are influential in the process. You and Michael both mention the possibility of comparing survey responses with actual behavior. But given the subjective and multi-factored analysis that goes into publication decisions (and the small sample size at top journals), I wonder if you have thoughts about how that might be measured. It seems exceedingly difficult to me to separate out the many not-really-independent variables that make up a publication decision. Even if one found, for example, that authors from less prestigious faculties are underrepresented, wouldn't you have to show by some mechanism that their articles were as "good" as the ones that were published in order to demonstrate that their affiliation was a significant factor in the rejection? I don't have an empirical research background (Jason was the brains behind that part of the operation), so there may be techniques for dealing with this problem, but it seems like a significant barrier to the sort of study you suggest. As I mentioned in a previous post, self-reporting bias is something social scientists learn to live with, unless they are willing to put in the time, the extraordinary effort, and have the resources to conduct an experimental design to control for unwanted influences. And even then, experimental designs have their own set of problems. Chris did bring up an interesting finding in our study that I would like to briefly address. 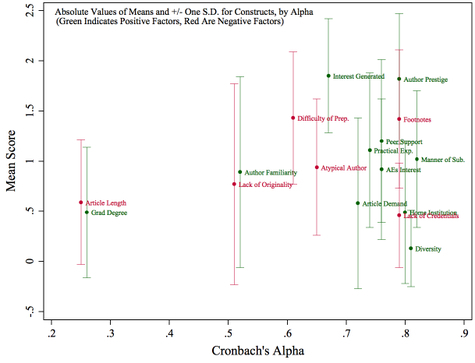 It is true that author prestige was among the most influential factors when isolated from the others, but when the editors were asked to rank it against other factors such as persuasiveness of the arguments, originality, etc., it ranked last. We were puzzled by this as well. Although social desirability bias may explain this discrepancy, other plausible explanations exist. The one that seems most reasonable to me is as follows. An author’s prestige, while certainly influential, will not be enough to warrant an offer of publication if the arguments are not persuasive/original, or the article does not have the potential to influence other legal scholarship. Whether students are capable of making that call is open to debate, but if a student can recognize those shortcomings, the author’s notoriety will not save the article. I would be surprised to hear an editor say differently.